And now for something completely different: puffing and picking. Yes, that simple cigar box—like the ones you’ve got in the closet, the garage, and tucked who knows where—can make beautiful music beyond the joyous symphony of smoke the contents provide. Just ask Steve Cinnamon. 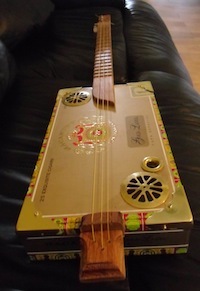 He’s a 64-year-old former ad exec living near Sarasota, Florida, who got involved in the old-time craft of cigar box guitars while recovering from a heart attack in 2009. He’s sold quite a few and been featured in newspapers and magazines. Cigar box guitar history goes back at least to the Civil War. Pickers range from Lightnin’ Hopkins and Carl Perkins to Tom Waits and ZZ Top’s Billy Gibbons. You can hear numerous performances on YouTube and get lots of information, including DIY instructions, at the Cigar Box Guitars website. If you’re interested in one of Steve’s creations, he said he’s still working on his website but you can email him. Love the off-the-beaten path story today. This looks awesome. Thanks again StogieGuys!